2 GRAD fire from Russia? What is the point of ignoring these "provocations" when there is an obvious response which nobody could dispute and which would be absolutely legal in terms of international (and Russian) law: fire back to *protect the Russian servicemen and civilians". This is really not that hard at all. Install a few batteries of Uragan MLRS in the right spots, set up a few counter-battery radars, place a few fire controllers along the border and wait for the Ukies to make yet another "mistake". And then turn the offending unit into dust with a single well-placed strike. Finally, announce that you will be doing just that every time the Ukies make that "mistake" again. It is difficult to say which side of the border the GRAD fire is coming from. I have seen two analysis on the web. The distance from the pool where the cameras are to the Ukraine border is 4350 m. Ukraine@war puts the GRAD position only 1.5 km away – without doing any analysis. Alex Bukovsky estimates them to be 5 km away. It is possible to estimate the exact distance. First you need to calculate the camera angle when zoomed in to the tele position. In the first video you see two utility poles on the other side of the pond. The distance between the poles is 54.5 meters; the distance to them is 205 meters. If we know the physical size of any object or event in the background we can calculate the distance. From Ghouta CW massacre research I remember that the burn time of a 122 mm GRAD rocket is about two seconds. Wikipedia says its speed ("muzzle velocity") is 690 m/s. One could thus estimate that the streaks of light coming from the rockets are about 1 km long. To get an better estimate one would have to compare this to other GRAD footage. The visible streaks of light seem to be less wide then the distance between the poles, putting the the event 4 km away. However, the flight times of the fireballs seem to be less then 2 second, meaning that the streaks are less then 1 km and the firing nearer. To get an exact figure one needs to plot the fireballs frame by frame and calculate the exact speed. In a similar vein, Ukraine@War posted the day before the above that the AN-26 shot down the 14th was downed by missile fire from inside the Russian border (as shown inset). There are two parts to that: a geo-location thing that puts the missile flying north just inside the border. That might well be sound, but the other part was deciding where on that line it originated. The whole explanation for that, as given: "We can see that there is a PERFECT area where the SAM could have been shot from, because this is a very forward position on RUSSIAN territory." Supporting this, the author (P. Martin) finds "See we can Numerous spots That Would be good to Position A SAM-unit" inside that Russian patch, and apparently zero such spots on the Ukrainian sides, north or south of there. 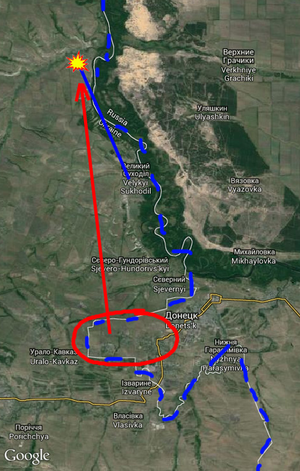 Google map satellite images reveal almost 40 artillery attacks from Russia to Ukraine. An investigation into the cross-border artillery attacks by Russian forces in July/August 2014 using only Google Maps. Evidence of 39 attacks from Russia is presented, along with many potential sources of artillery and GRAD fire. This page was last edited on 8 December 2015, at 04:48.